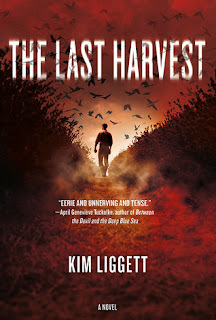 The Last Harvest is a YA horror novel from Kim Liggett. Holy crap, this is YA? The Last Harvest could have passed for an adult horror novel if it weren't for the sterotypical spin the bottle, 7 minutes in heaven, and high school football games. I probably would have recommended this to fans of Ania Ahlborn if the maturity level pendulum hadn't swung quite so far. 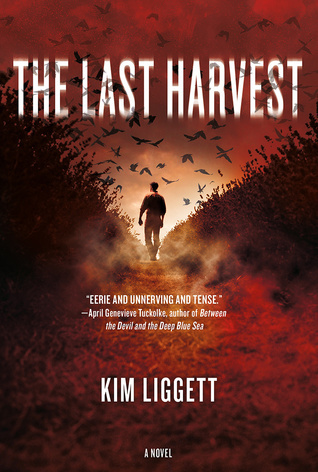 First and foremost I enjoyed the horror aspects of The Last Harvest. It was gory and it was unsettling. There was a dream sequence element to it all which usually doesn't work for me, but Kim Liggett managed to successfully make me wonder what was real and what wasn't. The only thing I didn't enjoy was the repetitive plot. Even when new things were happening, the structure of the story and the sequence of the action was very "lather, rinse, repeat". By 60% I was really wanting the story to wrap up. Despite my frustration with the structure, the entire book lead up to a very satisfying conclusion. Kim Liggett is an author I will be reading again. If you are a fan of YA horror, I would definitely check out The Last Harvest. It's not like any other YA horror I have read. I know right? Your first sentence was the thought that went through my head too when I finished the book. At the same time, I wish more YA horror was like this. I could have done with less teen drama too, but I loved that the author didn't hold back on the horror elements! YA horror and I don't always get along. I'd love more YA horror like this! The maturity level felt very inconsistent, though. I don't mind YA elements, but here they were kind of jarring. It was still a fun read, though! I will read this author again. I read her first book and am definitely giving this one a try. Teen drama doesn't interest me, but the fact that it's horror always grabs my attention. I've never read her before! There is good horror here. I like this rise in YA horror we're seeing but I imagine they're a bit mature. Doesn't bug me though. Sorry it was repetitive but at least the ending made up for it. Yes, the ending was great. In a world of half-a-story-YA, it was phenomenal. :D I hope you enjoy it!